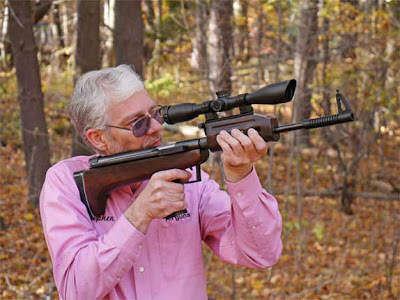 One solution to this issue is to use a scope with standard eye relief and mount this on the gun using the Leapers Offset Mount, such as the one you can see in this link. This approach has always been the preference of some QB57 owners because it allows almost any scope to be used with the gun. Another is to mount a red dot sight on the gun as this has infinite eye relief. The issue here is finding a red dot scope that fits airgun rails, as most current red dot sights have Weaver mounts, requiring the Leapers Tactical Adapter Rail. As a third option, we will be at the SHOT Show in 10 days time and plan to check with Leapers - and other vendors - for any other long eye relief scopes that could be suitable for use on the QB57. Leapers do have some new long eye relief scopes in the works, so we'll be establishing if they are suitable for use on the QB57. I'll let you know what we discover.